The heat exchanger on my current unit is only lasting about 6 years. New in 07, went bad 2013, replacement went bad 2019. I’m looking for a wall hung boiler with a better heat exchanger warranty. Sounds like a system water issue. Is the system treated ? If you are going through boilers in that short of a time frame it’s the water chemistry tearing the HX up. Either what @Gordy said or it hasn't had yearly maintenance. Or both. What exactly was the failure? Got pics of the last install? Dont know where my edit button went. Took a short service class on the Bosch Geenstar today and other than only a 5:1 turn down ratio it seems like a fine mod con. We worked on the combi only though. Pic of install attached, it is serviced/cleaned out every other year. Both failures have been pin holes in the heat exchanger coils. When was the last time your boiler water was tested? That’s a text book install. So those failed hx’s covered under warranty? Were you ever told why, and how they failed? Bynwhy, and how I mean that the manufacturer attributed the failure to something. Example water quality, which I think is your issue. Sent the first one back to manufacturer, which was replaced under warranty but never received any feedback as to what caused the pin holes in the coils. Again pin holes in coils and replacement was only warranted for one year. So since I have to pay full price for a new one, I was looking for a better unit but it sounds like my water chemist may be the culprit? FWIW… I really Like the IBC HC/ DC units. No matter what you get have the water tested. Clean it after installing and treat w/ a good inhibitor. I like the Fernox brand...there are others too. Using this to fill and purge the new boiler will help. That is a nice looking install. Too bad about the HXs. 3-9 grains hardness is rather generous compared so some other modcon mfg water specs. 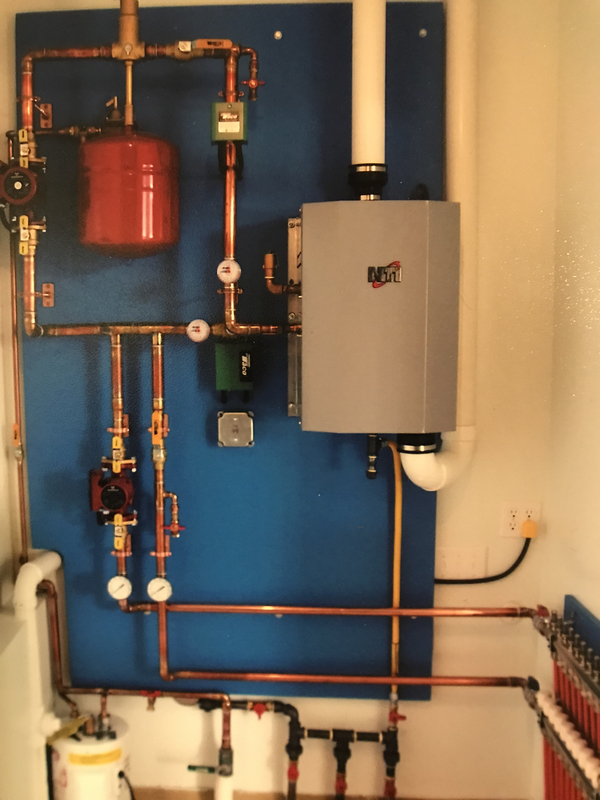 Water Chemistry – The installer of the Trinity Ti boiler must consider the condition of the water in the heating system. Ensurethe condition of the boiler water falls within the following parameters:Water hardness – between 3 and 9 Grains/gal.PH – between 7.5 and 9.5.Treatment - Boiler water must be treated with a corrosion inhibitor. Each Trinity Ti boiler is provided with a bottle of "FernoxF1 Protector" corrosion inhibitor, adequate to treat a 26.4 gallon (100 liter) heating system to a minimum required concentrationof 0.5%. Systems with greater volume will require more inhibitor. For information on performing the treatment, follow theinstructions included with the Fernox F1 Protector. See Table 9-1 for a list of recommended boiler system cleaners and corrosioninhibitors. IMPORTANT: To maintain protection, the level of corrosion inhibitor must be monitored periodically for the correctconcentration.Anti-freeze - For systems requiring freeze protection, use only inhibited propylene glycol, specially formulated for hydronicheating systems; use of other types of antifreeze may be harmful to the system and will void the warranty. Note: the use ofglycol may reduce the usable output capacity of the boiler, thus requiring the unit to be "down-fired" by limiting the maximumoperating capacity and/or the maximum water temperature. NTI recommends against exceeding a 35% concentration of glycol. Thank you all, the more research I’ve done, I’m confident that poor water chemistry has led to the heat exchanger failures. I’ll be installing a Fernox omega filter along with using a host of Fernox products to clean/flush and treat the system then monitoring the water chemistry balance. Take a look at the Caleffi Dirtmag vs. the Fernox filter. In addition to dirt and magnetic particle removal it's also a micro-bubble air-separator. Excellent product with a good track record.